The most common cause of similar problems is a stuck spacebar on the keyboard (dirt in the keys, etc.). After that, we've seen some third party plugins cause problems like this, and some external utility programs (haxies mostly). BUT, what you're showing is interesting. 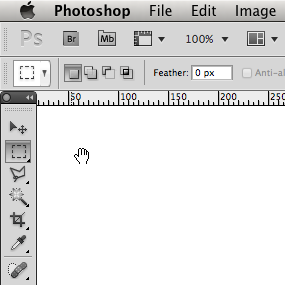 You do have the marquee tool active, and are showing a hand cursor -- but it is not one of Photoshop's cursors. The screenshot shows Photoshop CS4 or CS5, and the hand cursor in Photoshop has the fingers spread out more, not all going straight up. So, you're getting a hand cursor from something outside of Photoshop. Maybe a screen capture utility, or some system assistant? well since it is impossible to screenshot the hand tool, its a photoshop fake. nonetheless I hope it gets the problem across. I am having trouble with CS5 but already had the same problems with CS3. It occurs quite regularly and seriously stops me from working. hope there is a solution. Ah, I thought you were using third party screenshot tools that do allow you to capture the cursor. On and it occurs in one doc, other docs open at the same time are not affected and I can change tools. However its not restricted to a certain doc. It happens randomly. That's still sounding like the other causes I listed. 1. "The most common cause of similar problems is a stuck spacebar on the keyboard"
Well its happening with external keyboard and on laptop. I am on a Mac Book Pro under SnowLeopard and now Lion if that helps? I am surprised myself since I hoped after upgrading from CS3 to CS5 that problem was gone. I don't recall seeing similar problems from other users. Plus Photoshop CS3 and CS5 are quite different code. Are there any utilities you install on all your systems? Are there any OS settings that you always change (maybe Universal Access)? OS settings? Not as far as I am aware of. I work on CS6 and the same thing happens to me periodically. Hitting the space bar normally corrects the problem but I usually hit every key I can think of and often nothing seems to work. No matter what tool I select the hand tool is constant. It has happened to me on a different computer with a different keyboard. Is the tool really stuck, or is the cursor not updating to match the current tool? (which means a video card driver bug). In fact I found a cure. Zooming in and/or out helps. After doing it, Photoshop is responsive again. Strange but at least I can continue to work. Stumbled upon the solution by accident. I don't actually think it's a bug, rather just a strange setting toggle located under the primary tool drop-down menu (in the upper left corner) called "Current Tool Only". Still no idea how this box became checked, I must have inadvertently hit some shortcut command and activated it. Not sure if this is what's causing all your problems, but hope it helps someone. this was it. omg thank you. I have the same problem and after update to Yosemite it happens often. After drawing, I can't switch to any tool untill I hit Space to switch to hand tool and back. 'Current Tool Only' doesn't help. Even if, I'll run only Photoshop (which is impossible during work), it still appears. I keep having the same problem at least once a day. Seems to happen when I do rapid cloning with the clone tool. All of a sudden the tool is stuck on the hand tool and when I cycle through screen modes (using the F key), instead of going through the 3 modes it stays in the current one (Full screen with Menu bar) and cycles through a few different background colors (blue, grey, black and dark grey). Sometimes it goes away after about 15 seconds and once in a while I have to quit PS. Me and my work partner have been having this problem for at least 4 months now on different computers. Are you running any other apps or extensions? If so, take an inventory of what applications are also running when this occurs, then quit them one by one and see if the problem goes away. The only app that I always have running is Microsoft Office. But it also happened on a different computer that does not have anything else running. Yes!it is other app cosing the problem. I closed my Line chat and problem solved, thank you so much! I have had the same problem with the hand tool, and it does tend to happen when I have been cloning in fast succession. For a long time this annoyed me no end and at first could only get rid of it by rebooting the computer! however I stumbled upon something quite by accident that unfreezes this behaviour. It usually happens when cloning or spot healing brush, so while the tool is selected I hold down the spacebar which ordinarily changes to the hand tool temporarily, however if I also brush vigorously back and forward for a second, it frees up the hand tool and reverts back to the clone or healing tool and I can continue to work, It is still annoying, but now that I can fix it within a second, as I am going along, it is less of an aggravation. I have tried it on several different computers, so I think it has to be a photoshop bug? And do you have an OS utility that responds to pressing the option key or spacebar (like MouseKeys or localized keyboard switching on MacOS)? Ha, That WORKS! Thank you for that solution! Finally I can just keep working when it happens and don't have to quit and/or restart. +1 for the rapid movement fix working, thank you. This bug is aggravating as can be. OSX 10.9.5, Mac Mini, 2.3GHx i7, 16GB RAM, using Adobe CC package, with no other programs or plugins running. (I wish people would stop blaming 3rd party apps, this is sooooooo an Adobe/OSX compatibility issue. I was working on a client's computer last week and the exact same thing happened. That computer is an older MacPro with PS CS6 and the only thing in common was the use of a wacom tablet. I have the latest MacPro desktop and CS5 and it still happens for me (this has been a problem for a few years. It happens most frequently when I have just zoomed up or down, usually when using the modifer key and the mouse scroll wheel. This is a 2 or 3 time a week occurrence. The largest percent of the time, hitting the spacebar fixes it but now and then nothing helps, not even quitting photoshop. A reboot ends up being required, though I think there's a better solution that I just haven't found yet. I haven't found any correlation yet to the Mac model, dirt in the space bar or other apps. If other apps are the case, then it's something common to every Mac I've used. Have you installed the WhiteWindowWorkaround plugin to work around some known problems in more recent versions of MacOS? Also, there is another topic about CS5 on MacOS 10.10 and the issues in the new OS version. I too have this problem with PS CC2015 running on Mac Pro 3.5GHz 6 core... happens many times throughout the day! Nothing else running... just happened & then went away by itself, but other times I've had to reboot the computer. Very frustrating. Even though my reaction is a little late, the solution was for me (over and over again) to simply change tab and switch back to the original one. Loads of other different attempts to solve the problem didn't work out the way i hoped. So assumably it's some kind of bug. Hope i could be of some assistance! I may have a solution for this problem. If you edit layer styles (lets say add stroke) the layer styles window pops up, AND the tool is switched to hand tool as long as the layer styles window is open. The window may be open in a place you dont immediately see, and that is the cause of confusion. Since I switched between a wide monitor and laptop screen the popup window was nearly out of my laptop screen. So it was not a bug for me, just missed a window. I am stuck on the hand tool and when selecting other tools it still stays on the hand tool. I have a MacBook Air 13-inch early 2015 and version 10.13.2 macOS High Sierra. I have turned the laptop off and on again and that doesn't work. I have deleted Photoshop and Illustrator 2017 and re-downloaded Photoshop 2018 19.0 and Illustrator 22.0.1 and I still have this problem. My space bar works fine. I have contacted Apple and they believe it is a Photoshop/Illustrator/Adobe problem/bug as the hand tool is only effecting photoshop and illustrator. I have literally tried everything and nothing seams to work I need to use these program daily for my degree. what would you want me to screenshot? I had the same problem and it turned out that i had a dialog window open for some reason all the time. if you have a dialog window open the hand tool is shown. The window was almost hidden, only a 1 px line was visible on the interface. that's what I'd look for. Seriously, this is the most annoying problem with Creative Suite I've ever come across. I have experienced it for maybe six or seven years, running the very latest Creative Suite on top-of-the-range Macs. And I've been searching for solutions on and off that whole time. It's not 3rd party plugins, it's not a stuck spacebar, it's not a dialog box somewhere out of view on another monitor. I have tried all this stuff. I read somewhere that having Chrome open at the same time was the problem, and even having 1password open on the Mac was the cause of it, but alas, no. The hand tool freeze occurs even when I'm just running Photoshop on the Mac and nothing else. The only consistent factor for me over the years has been having a Wacom driver installed, as even if the tablet isn't plugged in the hand tool freeze still crops up. I have been in touch with both Adobe and Wacom about it, and neither company will take responsibility for finding a solution, they kind-of just blame each other. What I'd really love to know is how do illustrators that completely rely on a combination of Wacom tablets and Photoshop actually manage to do any work? I'm desperate to hear from an ultra-heavy Wacom + Photoshop/Illustrator user to hear how they deal with it. Is the only solution a reboot and making yet another cup of coffee? 7 years and still no real solution. Happened to me this morning on an iMac running the latest OS and CC products. How about it, Adobe? Rebooting the machine and restarting the same applications that were running previously remedied the situation. I think this suggests that 3rd party apps may not be the culprits this time. Also, nothing like this has ever happened to me with any other software (and no thread about this issue that I could find mentions it happening with other applications). Is it not reasonable to suspect that something about it may be unique to the way Photoshop handles cursors? Have you tried booting in safemode to rule out any extensions? Many times when the hand is stuck it thinks the spacebar (a keyboard shortcut) is pressed. If this wasn't a system specific issue/conflict, we'd see millions (maybe billions) of complaints in a 7 year span. A simple reboot fixed it this time. Hopefully it won't recur. Just wish there was a way to pinpoint what it is. Why would Photoshop think the space bar is pressed, but no other app? This reply was created from a merged topic originally titled Cursor stuck on move tool. After using photoshop for a while, my cursor just randomly changes to hand tool and gets stuck on hand tool forever. Restarting Mac works but I don't want to do that every time it happens. Is there are way to solve this problem? I may have found one possible explanation. This happened to me again this morning as I was working while accessing my main computer remotely via the MacOS built-in screen sharing (VNC).